Nuts are cultivated on a wide scale to obtain the valuable nut meat, i.e. the fruits or kernels which are often encased in hard shell covering. 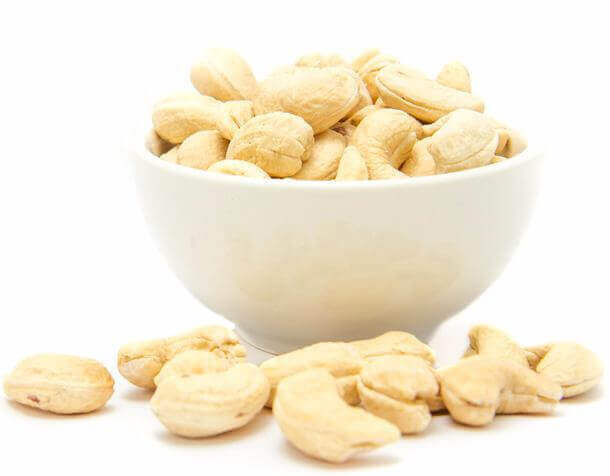 Nuts are a delicious addition to several food dishes and add a great crunchy Shimla Hills is an Indian dry fruit nuts supplier offering wholesale and bulk quantities of nuts, primarily cashew nuts. The cashew tree is large in size and evergreen, growing up to 14 m (46 ft) tall in height. It has a short and irregularly shaped trunk. Though considered in the nut category, cashews are actually seeds that grow out of the apples. We offer premium quality cashew nuts that are processed using the latest technology. India is one of the leading raw cashew nuts suppliers as well as processing hub of the world. Few other nuts that are popularly produced and exported from India include chilgoza (pine nut), almonds, pistachios, walnuts, coconut and peanut. Large-scale commercial production of Indian dried fruits and nuts is done to furnish their growing demand in the world, both for health benefits and industrial purposes. Nuts have a high nutritional content, which includes fats, vitamins, essential amino acids, vitamins and most importantly the omega-3–fatty-acid that helps in controlling high BP, fight against breast, colon and prostate cancers. For example, cashews are highly nutritious with about 21% protein, 46% fat, and 25% carbohydrates. The high nutritional value of nuts also makes them one of the most popular snacks around the world. In the Middle East, almonds, pistachios and walnuts are used in roasted stuff chicken, over pastries and in rice dishes. Almonds, cashews and pistachios are frequently found in Indian biryanis, desserts, ice creams, puddings and rich vegetarian dishes.Nuts also find a wider use in food processing industry in the bakery, snack foods, chocolates, roasting and breakfast cereals as well as pressed to extract oil. As trusted cashew nut suppliers, the processed nuts are rigorously checked for quality before they are hygienically packed to retain their natural taste and freshness.